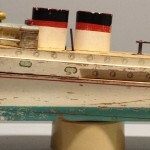 I was excited to find this Keystone Mechanical Ocean Liner #238 recently. 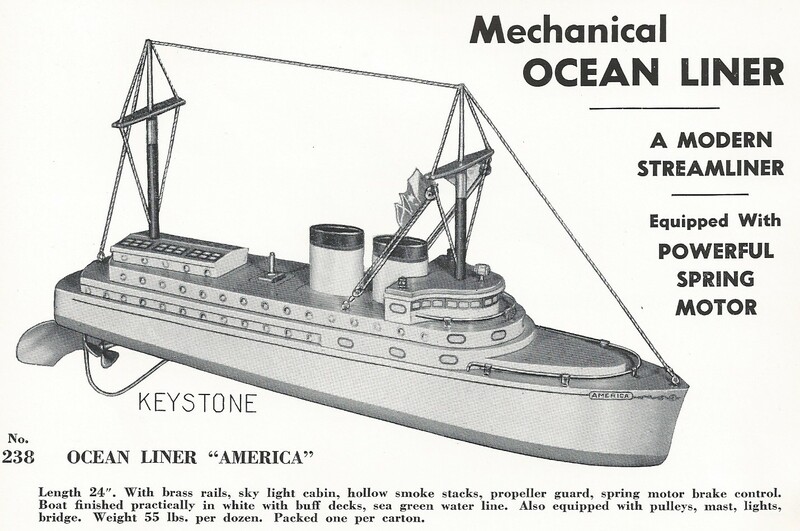 It is one of the largest ships that Keystone made and it was only produced in 1941. The measurements are 24″ x 5″ x 6″ and weighs almost five pounds. The spring motor is quite strong to move this ship through the water. 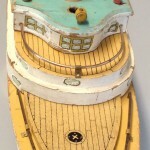 This example does have some condition issues such as missing the masts, rigging, propeller guard and rudder. 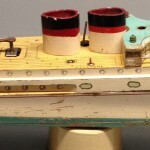 You may notice a “split” in the hull below the water line. This is where two separate pieces were joined to create the shape of the hull. Over time the joint of the two pieces has loosened but the pieces are intact. Despite these shortcomings the ship was well worth the purchase as these are very hard to come by. 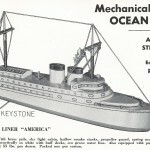 I have included an entry from a 1941 Keystone catalog to show what the ship looks like when complete.